Information for Clinicians, Kinesio Tape, Kinesiology Tape Products, Kinesiology Taping News | by Tape Expert | Comments Off on What is Kinesio Tex Gold FP Tape? Kinesio Tape introduced the first kinesiology tape to the world over 30 years ago. Since then, KinesioTape has gone from a little known alternative treatment to a mainstream therapeutic modality used in clinics and hospitals around the world. As kinesiology taping gained popularity, competitive brands entered the market with innovations such as precut strips, precut applications and a n eye catching assortment of colors and patterns. Kinesio was slow to respond and brands such as RockTape, SpiderTech, PerformTex, KT Tape and StrengthTape gained market share. 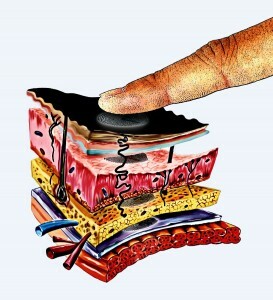 Last year, Kinesio introduced a line of precut applications, as well as precut fan strips. And now, Kinesio has stepped back into the limelight with a major re-engineering of its flagship product – Kinesio Tape. 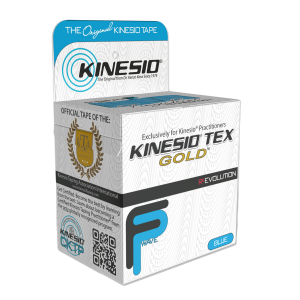 What makes Kinesio Tex Gold FP different? New color added – now available in white! Kinesio Tape FP retains the core elastic properties of the original Kinesio Tape designed to be used with the official Kinesio Taping Method. The adhesive continues to be hypoallergenic and latex-free, making it suitable for all patient populations. It appears that Kinesio has hit a home run with the introduction of Kinesio Tex FP. They managed to create a cutting edge new product that also retains all of the important properties that have made Kinesio the world leader in the kinesiology taping industry. Note: Kinesio will continue to offer their original formulation and wave pattern adhesive under the name Kinesio Tex Classic. Kinesio Tex Classic is available 4 meter (13′) rolls in beige, black, blue, pink and white. Kinesio Tex Gold FP, Kinesio Tex Classic and all other Kinesio products are available online at Theratape.com, a website specializing in kinesiology tape and kinesiology taping products.